DALLAS, TX--(Marketwired - Nov 2, 2016) - Parks Associates announced new research today showing that Apple Watch owners are more engaged with their devices than all other smart watch owners. Leading Smart Watch Apps: Insights into Wearable Use Cases reveals 31% of Apple Watch owners search for information using voice commands on a weekly basis, compared to 19% of non-Apple smart watch owners. Further, 45% of Apple Watch owners make or receive phone calls with their device compared to 23% of all other smart watch owners. "One month after the Apple Watch's release in 2015, 36% of U.S. smart watch owners reported owning an Apple Watch," said Chris Tweedt, Research Analyst, Parks Associates. "In the year following its launch, this percentage has increased steadily to 39% and will continue to increase after the recent release of the Apple Watch Series 2. Although smart watch sales were hurt by a lack of new models in the first half of 2016, we expect 2016's holiday sales to be robust." 50% of Apple Watch owners check the weather on a weekly basis, compared to 29% of non-Apple smart watch owners. Only 29% of non-Apple smart watch owners reply to notifications with their device each week, while 56% of Apple Watch owners do so. Parks Associates identified three emerging smart watch app trends, including IoT, monitoring for insurance, and mobile wallet expansion. 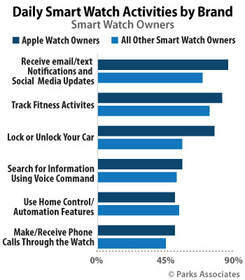 "Increasing sales have expanded smart watch app development," Tweedt said. "The Apple Watch, for example, announced that 10,000 apps were available for the watch just a little over four months after launch, while Android Wear has over 4,000 available apps. The two primary smart watch use cases are fitness tracking and notifications, but use cases such as mobile payments, smart home and security, and vehicle access are emerging." Leading Smart Watch Apps: Insights into Wearable Use Cases, now available for purchase, analyzes trends in the development of tethered and native apps for smart watches as the smart watch industry ramps up production and faces fiercer competition. It highlights perspectives from watch brands, app developers, and consumers about the most significant smart watch use cases and business strategies to increase usage and boost brand loyalty. For more information, visit www.ParksAssociates.com. To schedule a meeting with Chris Tweedt or request specific research data, contact Holly Sprague at hsprague@gmail.com or 720-987-6614.